If you step back and think of Facebook as being useful for basically two things, advertising/propaganda on the one hand, and establishing and maintaining an online network of contacts who may or may not be personally connected to you in the "offline" world, the thing has some uses. But it would seem that Facebook is a platform that is run by people who are not able to admit that they're whole business model depends on relentless data mining to keep it running on the one hand, and on the other hand that the very nature of social media is to allow for the creation and distribution of what Jacques Ellul called sociological propaganda and horizontal propaganda. Facebook and Twitter are propaganda tools. It's hardly a surprise if people on the left or in progressive movements find them useful but the kicker is that these are social media platforms that are not looking to be all that regulated. Cambridge Analytica is not shaping up to be a bug or even a feature, it could be an opportunity for people to observe that mercenary data mining is the whole point of the social media enterprise in a platform like Facebook. If you understand that it's a propaganda platform then you can use it knowing what it's there for. If you don't know that it's a propaganda platform then you'll probably feel bad that the curated lives mediated by social media of people who may or may not know look better than yours. They aren't better than yours. Since Facebook is in the news for fairly obvious reasons I'll try to get to some of that with a links for the weekend post but this particular "case against Facebook" might misconstrue the business model. The business model is the data mining side of things. The "fake news" part isn't necessarily the only thing that can be done with the results of data mining. I'd write more a long the lines of what I wrote in "Mars Hill and the idol of social media" but I don't feel like doing that now. Living in Seattle where tech is one of the gods of the region, I was once asked if I would ever consider using a self-driving car. There's two parts to this. The first is that to get from point A to point B you have to trust someone to get there, either because you can drive yourself and trust the craft of the vehicle you use, or because you trust whoever is driving you and the vehicle they use. The second part ... and this is the part I'm going to focus on a bit more, I am generally of the impression that the kind of technology that was developed in the last fifty years to create self-driving vehicles that, once set in motion to reach their destinations, go the distance has had one reliable application. I have no problem with an AIM-120 being a fire and forget air-to-air missile. I expect that a self-directing vehicle literally hits its target destination because that's what it's built to do. The idea of adapting such technology to civilian transit scares me not because I think it's horrifying that military technology should somehow stain the civilian sphere. We have all sorts of glorious innovations in medical practice, surgery and so on thanks to military field innovations. No, the problem is that I already fear the human drivers who are no less likely to kill someone on accident than a driverless car. But you can sue the human driver of a car for something. So when I read about the recent death caused by a self-driving car my initial feeling was a depressed sense of the inevitability of this. Of course someone was going to get killed it was only a matter of how and under exactly what circumstances. … On Sunday night, one of Uber’s self-driving cars struck and killed a woman in Tempe, Arizona. Almost any given day I commute to and from work in the Puget Sound area I think of how I could very possibly die today because of how people are. You or I are far, far more likely to die at the hands of an inattentive driver than at the hands of someone wielding a gun. I'm more worried that of those wielding guns cops will be trigger happy than some random stranger might show up. It's not that I can't imagine someone being murdered by some person with a gun. The year iMonk died was also the year someone I met from my college years was murdered by a stalker who had been stalking her for years. All the same, I am always more afraid I'm going to get maimed or killed by some inattentive driver than I am afraid that I might be killed by someone with a gun. A self-driving vehicle for civilian use doesn't appeal to me. At least with the fire and forget weapon the expected probable death of the thing on the receiving end is intended. It may be me being old fashioned and close-minded about the limited applicability of self-driving vehicles but I think civilian society would be better off leaving this set of technical advances made within weapons tech firmly on the side of weapons tech. If there comes a day when I should, God forbid, get killed by a vehicle, I at least want to be able to have a second's moment of being able to see whoever it is that hits me and not see some harbinger of a Stunticon attack. Or maybe just put the Decepticon logo on every self-driving car and people will know to look for it. The reason we have to review so much old news and old material is because during the peak of controversies in the early 2014 period Mark Driscoll wrote a letter in which he claimed that the smallest location of Mars Hill Church was bigger than his total vision was for the whole of the church when it was started. On (or maybe before?) March 14, 2014 one Mark Driscoll posted a letter on The City to Mars Hill Church, which Warren Throckmorton has linked to via two different avenues. Something else we've looked at in the past is how in 2009 Mark Driscoll said that he had not started a side company to manage book royalties because of the selfish greed that was involved in that, although in 2011 he would set up precisely such a side company, On Mission, LLC, to manage book royalties for a book he would later publish in 2012, Real Marriage. ... In all of this, as well, I've had people ask, "So what about the book sales?" Here's how it works, I didn't start a separate company. One of the ways that guys work this, they become a leader in a church and they have a company on the side and they use the church to funnel business into their side company and I didn't start a side company (like a lot of guys do) for my book writing. Instead I publish under Mars Hill. Driscoll had made it clear in 2009 that he hoped one of his books would "pop", or that he'd have enough books in print, that he would be able to work for free and not draw a salary from Mars Hill. 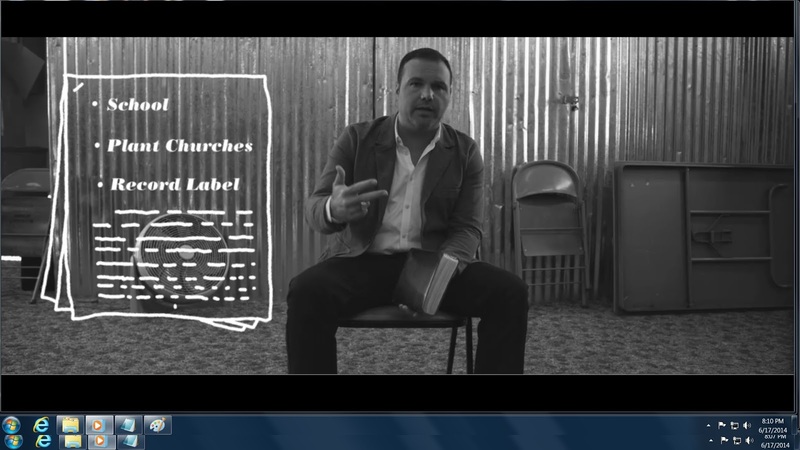 The Result Source contract did ensure that at least one of Mark Driscoll's books would "pop", if by "pop" this were understood to be making a #1 spot on the New York Times bestseller list. But along the way Mark Driscoll had started precisely the side company for managing book royalties that he regarded as a sign of selfish greed for gain ... in other pastors, which should continually raise questions as to what it was between 2009 and 2011 that made Mark Driscoll have a change of heart about owning a side company to manage book royalties. That's not something we have an answer for, but it's something to bear in mind because it would seem much of the decision-making to use Result Source on the one hand and to have the side company on the other were made well before Justin Dean took the reins of public relations at Mars Hill. In other words, we can have some understanding in light of the scandals that erupted on a nearly monthly basis at Mars Hill or about Mars Hill from mid-2011 through to the end of Mars Hill that there was arguably only so much a public relations person could have done to salvage the reputation of the institution and the brand. The gap between Driscoll's claim in 2014, that what Mars Hill was was "not even close" to what he envisioned, and what he'd repeatedly said had been his dream for what Mars Hill would become on the record in mass media, was too big to bridge with a few simple open letters to members. The gap between a public condemnation of side companies for managing book royalties for books by a pastor as being a sign of selfish gain that Driscoll preached in 2009 and the company Mark Driscoll set up in the run up to the publication of Real Marriage was also a rather big gap to bridge, even if Mark Driscoll and Mars Hill had never at any point followed the advice of counsel to make use of Result Source. Driscoll had made it clear from the earliest days of Mars Hill he wanted to start a record label and that publishing books was part of his long-term vision, along with founding a Bible school. So when he wrote that all of that sort of thing that Mars Hill was striving to achieve in 2014 was "not even close" to what he originally envisioned, his own decades of preaching and writing testified against him. Not even the greatest public relations person in the world was likely able to help Mark Driscoll out of what was arguably a self-generated public relations fiasco. Personally it's hard to believe that all of the controversies were simply ones that erupted that Mars Hill somehow couldn't handle. Mark Driscoll was adept at provoking controversy and it's hard to take seriously that at any point Rachel Held Evans' public statements against Mark Driscoll as being a bully weren't aligned in some way with her own book publishing and book promotional schedules. After all, Thomas Nelson published Evans' book and Mark Driscoll's book within the same calendar year. A person might at least entertain the possibility that if Driscoll and Evans were that opposed to each other they wouldn't even wish to share the same publisher, would they? Something to bear in mind about internet firestorms between ostensibly opposite sides of an issue who share a publisher in common. FINALLY, BY 2014 MARK DRISCOLL WAS CLAIMING THE REASON THERE WAS NO CHILDRENS' MINISTRY AT THE START OF MARS HILL WAS THERE WERE NO KIDS, DESPITE HIS OWN TESTIMONY THAT HE RECRUITED CO-FOUNDERS MIKE GUNN AND LIEF MOI, IN PART, BECAUSE HE CONSIDERED THEM GOOD FATHERS. 1) how ambitious was Mark Driscoll's initial vision for the expected achievements of Mars Hill? 2) if setting up side companies to own book royalties indicated a pastor with a selfish greed for gain had Mark Driscoll quietly done an about face on his publicly preached principle? 3) had Mark's understanding of the history of MH as a church co-founded with two men who were fathers he admired slipped his mind when he claimed the early MH had no children? It seemed as though Mark Driscoll's memory was insufficiently reliable to be taken at face value or, worse, he could not be trusted to give a factually accurate account of widely and well-established facts about the history of Mars Hill Church regardless of any potential motive. Now with the two preludes wrapped up, we can get to discussing the book Justin Dean wrote and published.